The FrSky Smart Port Lipo Voltage Sensor plugs into the balance port of your battery pack and allows you to monitor pack voltages while flying. No more guessing what is going on with the state of your battery. The Smart Port Lipo Voltage sensor is easy to use, just plug it into a Smart Port equipped receiver at one end, and plug the sensor into the balance port of the battery you want to monitor. That is all there is to it. It can measure total pack voltage and individual cell voltages. It is also very handy for checking battery voltages outside of the plane. 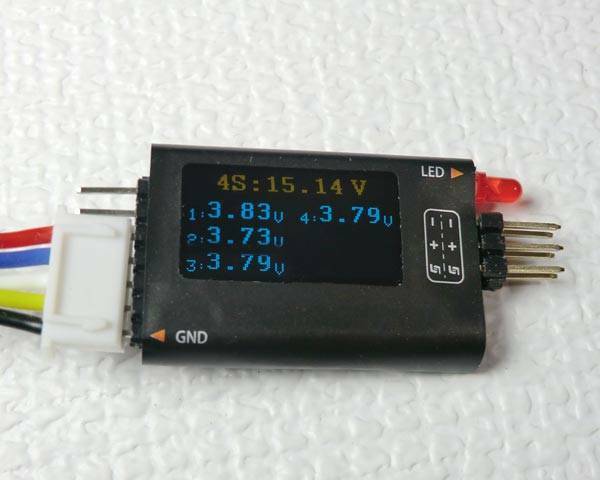 Just plug in a pack and check the easy to read OLED display. FrSky Smart Port enabled receivers such as the X8R, X6R, X4R, etc.